Millions of informal workers across India may see their minimum wage entitlement more than double from Rs 176 per day at present to Rs 375 per day or Rs 9,750 per month, if the government accepts the norms proposed by a committee set up to determine how the national minimum wage should be calculated. Currently, the formula for calculating the national minimum wage presumes that each wage earner supports three persons (“consumption units”), and that a “consumption unit” needs at least 2,700 calories per day (in addition to essential non-food items such as clothing, medicines and transport). 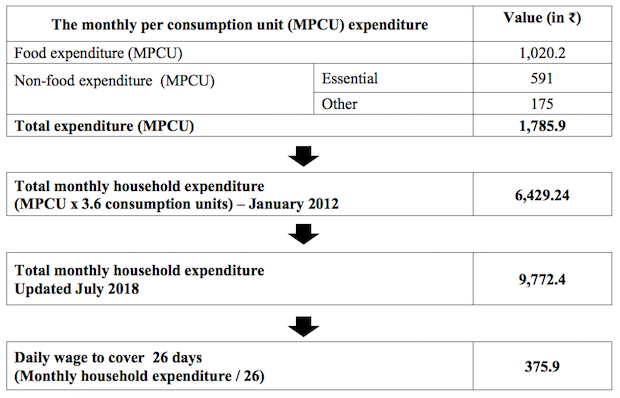 The new formula, arrived at by using new evidence on how and how much households consume, suggests increasing the number of “consumption units” per household to 3.6. Given “a reduction in the proportion of workers engaged in heavy work and an increase in the number of workers in moderate and sedentary occupations”, the committee recommends reducing the per head (adult) minimum calorie requirement to 2,400 calories, but also that the monetary value for food consumption used in the formula must account for including 50 grams of protein and 30 grams of fat in an adult diet. With the new formula--which also ascribes enhanced values to essential non-food items--the committee has arrived at a figure of Rs 375 per day, or Rs 9,750 per month, as the national minimum wage. The Report of the Expert Committee on Determining the Methodology for Fixing the National Minimum Wage has been prepared by a committee chaired by Anoop Satpathy, a fellow at the VV Giri National Labour Institute, an autonomous institute under the labour ministry. Such a national minimum wage would apply across the country irrespective of sectors, skills, occupations and rural-urban locations, the report recommends, and would represent the basic minimum wage that enables healthy living and efficient performance at work. More than 80% of Indian workers are employed in informal jobs, as per the International Labour Organization’s 2018 report, Women and Men in the Informal Economy: A Statistical Picture. These workers are unable to negotiate decent wages and working conditions, and often have no social security benefits. The increase in minimum wage recommended by the committee--to Rs 375--looks like a lot compared to the Rs 176 at present, “but if you compare it to the central minimum wage, it is not an increase”, Sabina Dewan, president and executive director of research organisation JustJobs Network, told IndiaSpend. The central minimum wage is what is paid to workers in central government organisations or those working on central government projects, e.g., a building in Odisha for the IT department. It starts from Rs 333 for agricultural unskilled workers and goes up to Rs 728 for highly skilled, industrial workers. Alternatively, the committee suggests, the country could be carved up into five different regions with diverse socio-economic and labour market situations. The national minimum wage for each region could be estimated using a nationally representative food basket (but at regional average unit price of each food item), the committee says. The report discourages using regional food baskets in order to “dissociate the consumption pattern from the level of poverty and ability to pay in a region”. The required expenditure for non-food items would, however, be estimated separately for each region. As per the committee’s estimates, the minimum wage for various regions, thus calculated, would range between Rs 342 per day (or Rs 8,892 per month) and Rs 447 per day (Rs 11,622 per month). Recognising that house rent “accounts for a significant proportion of the overall non-food component”, the committee has recommended an additional house rent allowance, averaging up to Rs 55 per day or Rs 1,430 per month in cities, to be paid “over and above” the national minimum wage. The rent allowance may vary by city and town, and the committee has recommended that a separate study look into it. At present, various state governments have opted to fix minimum wages for at least three or four categories of workers based on their skills level--unskilled, semiskilled, skilled and highly skilled. The national minimum wage recommended by the present committee applies to workers across skill levels. However, the committee says, to know whether minimum wages should vary by skill level would need a detailed analysis of the National Skill Qualification Framework (NSQF), as well as a standard approach to define skill levels at the national and state levels. It recommends that a separate committee be set up to study this in collaboration with stakeholders such as the skill development ministry as well as employers’ and workers’ organisations. The panel has also recommended reviewing the minimum wage every six months based on the changes in retail price fluctuations, as some states do at present (and others do after a gap of five years). 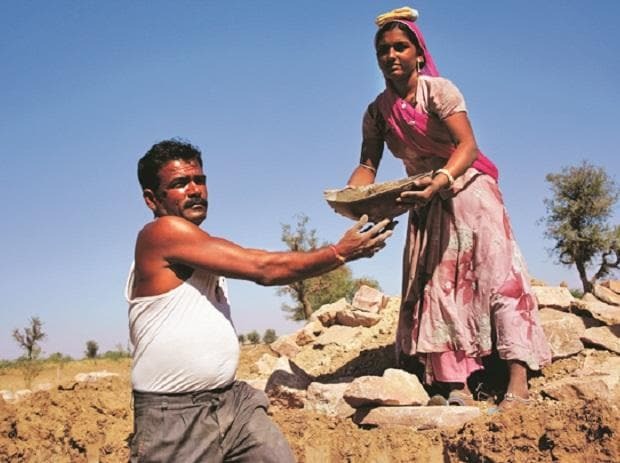 The labour ministry, in its preface to the report, says the committee’s work aims to achieve “decent work and inclusive growth” for India’s workers, and acknowledges the need for India to address issues such as low pay, wage inequality and gender wage gap. "The government is ever committed to improving the living conditions of informal economy workers who contribute significantly to India’s economic growth and progress," the preface states, "A minimum guaranteed income for all workers would therefore go a long way towards bettering workers’ living standards and help India achieve many of its socio-economic goals, including the United Nations Sustainable Development Goals (SDGs)." The Code on Wages Bill introduced in Parliament in August 2017 aimed to achieve these objectives by making the national minimum wage legally binding by giving it statutory backing. At present, although a national minimum wage floor has been in place since the 1990s--and has risen progressively to Rs 176 per day in 2017--some 62 million workers are paid less than the indicative national minimum wage, as per the International Labour Organization’s 2018 India Wage Report. The rate of low pay is higher for women than for men. Making the national minimum wage legally binding would require fixing a single national minimum wage--or different national minimum wages for different states or geographical areas--which was the remit of the present committee. However, the term of the 16th Lok Sabha having ended, the Code on Wages Bill has lapsed and would have to be reintroduced in parliament after the next government comes to power. The committee’s report would also have be considered by the subsequent government. A study by JustJobs Network that looked at wages across the globe suggests that successful wage regimes include a minimum wage that serves as a floor to ensure workers’ basic needs, Dewan said. “They must also provide compensation ladders, established through sound industrial relations and collective bargaining in which wage growth is aligned with productivity and prices,” she added.